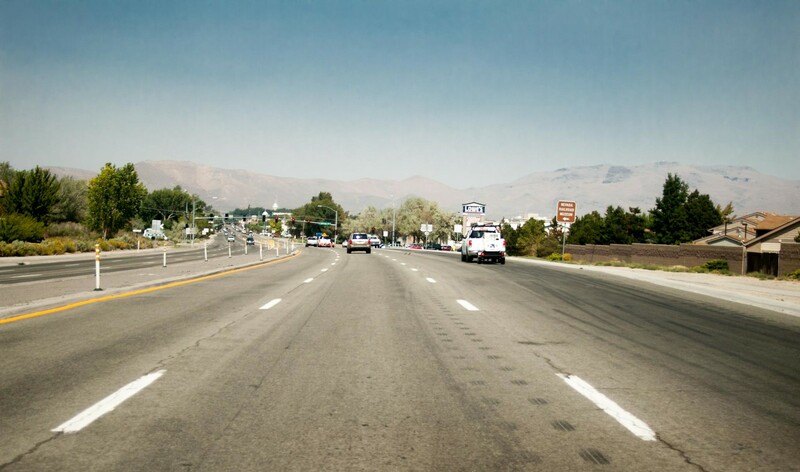 A single car travels up a very narrow Hwy 395, approaching Carson City from the south. This photo is from the mid 20th century, when the city limits of Carson barely went beyond 10th Street. South of town there was little save sagebrush. One solitary ranch stands out, marked by the large cottonwoods, at the intersection of what today is Fairview Drive. The tracks of the V&T Railroad run through the brush to the right, on their way to Minden. Otherwise, this is just a quiet spot in the Eagle Valley on the outskirts of town. 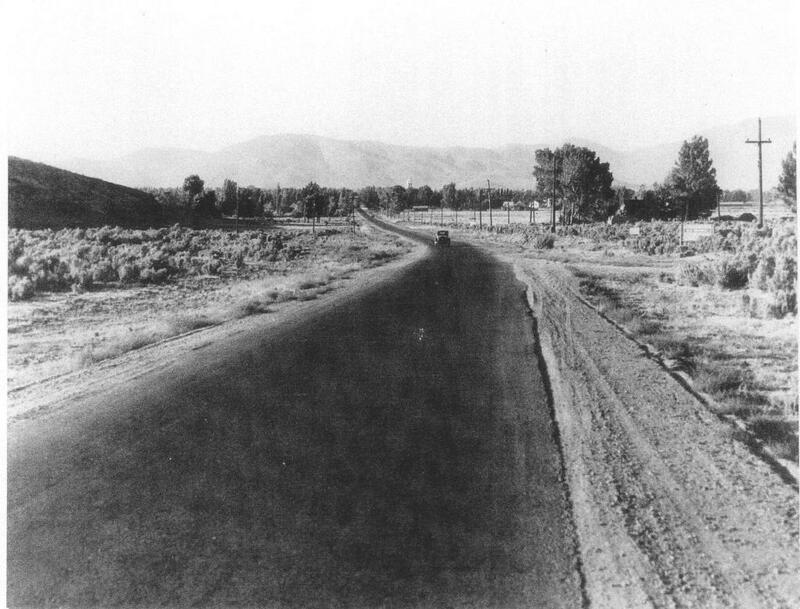 The explosion of growth in Carson City in the second half of the 20th century sent the city limits expanding all the way out to the rim of the valley in every direction. The majority of growth was along the three major highways out of town; Hwy 395 to the north, Hwy 50 to the East, and 395 to the south. Here we see the results of that expansion. a stretch of lonely road that used to be outside of town is now considered pretty close to the middle of the city. Carson and Fairview is a major intersection, as thousands of trucks turn here each day headed out the new freeway. And all this empty land has been filled with homes and businesses. Just to the left of the picture is the Nevada State Railroad Museum, situated just a few hundred yards from the former tracks of the railroad it memorializes. The road has gone from two lanes, barely, to six, and the daily car count past this spot is probably higher than the entire population of Carson City when the first picture was taken. The ranch has been replaced by a shopping center, and 10th Street isn’t even the edge of downtown anymore, much less the city itself. 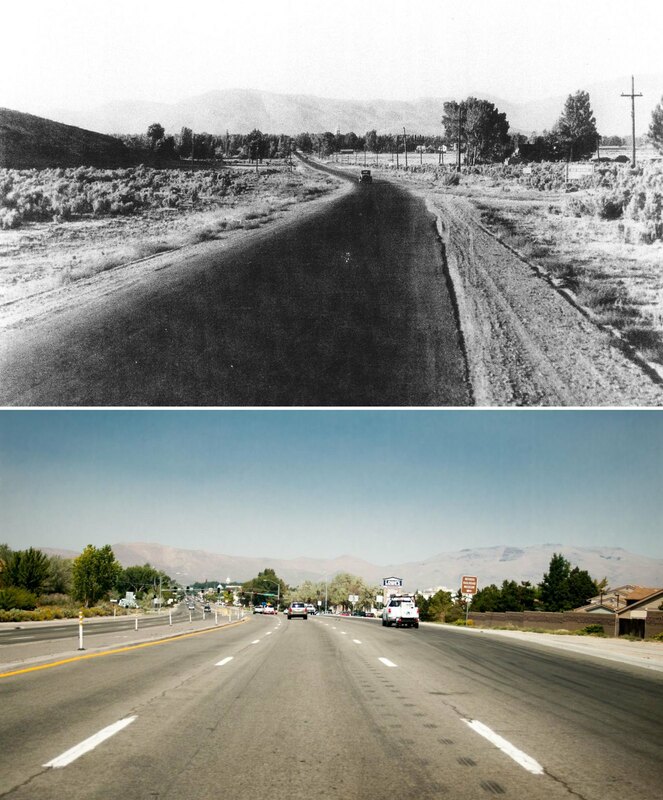 Carson City exploded over the course of just a few decades, and this comparison is a vivid reminder of how far the town has come. One thing remains the same, though, the glint of the Capitol dome, beckoning you to the center of the city.